Mother Anne-Marie preached this week on the Feeding of the Five Thousand. It’s school holidays and time for outings. I am planning some days out this coming month with my grandchildren and weather permitting we will be packing a picnic or two. I vividly recollect a day I had at Eastbourne with my elder daughter, her partner and their three sons and little daughter. We took with us some of the cousins – two extra boys. Three adults and six children – the size of our family group attracted attention. Three or four times in the day, my daughter was asked if the children were all hers, and we got into the Redoubt museum at cut price – “there are so many of you” the man on the desk said – I think he was embarrassed to charge us full rate. As we picnicked on the beach, I began to realise just how much food my daughter had had to prepare for the nine of us. Two huge picnic bags revealed more and more food – but five boys who have been running in and out of the sea can eat an awful lot of food, and only half an hour after they had finished, the first voice piped up, “is there anything else to eat?” Feeding nine people at a picnic takes some organising. Jesus expected the disciples to feed five thousand and there had been no planning. Our gospel story this morning, the impromptu picnic in the Galilean countryside, has become one of the iconic stories of Jesus. There are only a few stories that appear in all four of the gospels, but this one, if you count the feeding of the four thousand, which is essentially the same story, this story appears six times, not just four. The feeding of the multitude was obviously of huge importance in the telling of who Jesus was and what he expected of those who followed him. Two phrases stand out for me in Matthew’s version of the story that we heard this morning, two different responses to the same problem. “Send them away” and “Bring them to me”. The disciples had concern, but were overwhelmed because they had so little. Jesus takes what they have to offer and makes of it so much more. He blesses and breaks the bread and gives it back to the disciples and they then go and feed the multitude. It is an unexplained miracle – we don’t know exactly what happened, but we know when Jesus took what they had to offer, blessed it and broke it, then it went round. Not only did it feed them all – and they were 5000 men plus the women and children, not only was there enough but there was enough left to fill 12 baskets. It is hard to imagine this miraculous abundance – what can happen when we combine our resources with the love and blessing of God. You will have noticed how some of the things that happened at the feeding of the five thousand are similar to what happens every Sunday here at the Eucharist. Jesus took bread, blessed it and broke it. I think that what happened in the Galilean countryside was a holy moment as the Eucharist is each time for us, a holy moment. Jesus ordered the crowds to sit on the grass – no mean feat in itself given there were so many of them. They all sat down and we can imagine a hushed silence and that their eyes were all focussed on Jesus as he took the bread and blessed it. 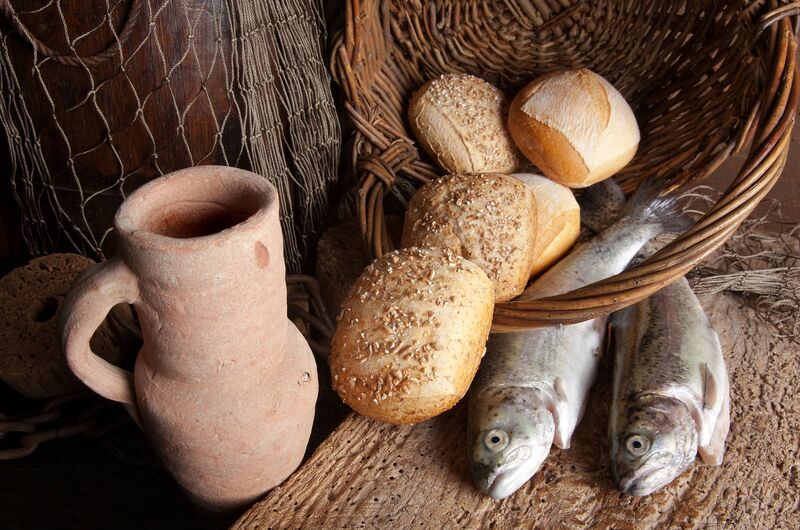 As the disciples came amongst them giving them the bread they all became aware of the abundance, some of them no doubt became aware of the presence of God. There was after all something so special about what happened that evening, that the gospel writers all tell us about it and two of them tell us twice – of course there may have been two occurrences – but even if that was the case they don’t edit one of them out. In the early church the story quickly took on Eucharistic significance. We know that this gospel was often read at the Eucharist not once every year or so as we do, but often. Most of us have known these moments of heightened significance – be they in a human relationship or in our spiritual lives. The disciples experienced it at that impromptu Galilean picnic and the first Christians experienced it each time they broke bread together. “And bread I broke with you was more than bread”. It was a holy moment, but also became a profound lesson. The holy action of taking of what they had, blessing and breaking became the lesson about discipleship. We cannot just send people away. Instead we offer ourselves and what we have to God in the service of others. “Bring them here to me” is Jesus’ call to you – come here, just as you are, with the talents and possessions you have however meagre they may seem. Bring them to me. I will bless them and break them and then we shall see what happens. This attitude can be manifested in very small ways, but what seems small can become profound. I was talking recently to some people from a church in Welling. They said “we have started a Lord’s Larder in our church – it has been amazing” they said. The idea is simple. When members of the congregation do their weekly shopping anything they get on a BOGOFF – buy one get one free – they bring to church for the Lord’s Larder. This congregation isn’t wealthy, but this they feel they can do. And the proceeds of the Lord’s Larder are used in two ways – they are available to the vicar and other members of the congregation if they know someone who is going without, and other produce goes to help families who use Welcare in Greenwich – that’s how I know about it. We know that some people in our community are beginning to have to make difficult choices – “fuel or food?” is going to be a question many families and elderly people will be asking this winter. The Lord’s Larder at this church in Welling is a practical thing, but I also said it was profound. The members of the congregation I talked to told me they had been amazed, amazed at the response – people were bringing something most Sundays – a tin of soup, a packet of nappies – it was growing and it was being used. I could tell as they talked about it that it was having a profound effect on people – it was taking on holy significance. Later in this service we will come forward to receive communion. We will receive the bread, which has been brought forward, given, and is then blessed and broken, and given back. Today as you come forward think about the picnic in Galilee. As you come forward be a disciple with your five loaves and two fish – let those be what you have – your talents and possessions – and give them to the Lord to bless and break. As you receive the bread and wine receive back yourself and what you have, blessed by God and broken by God, to be shared with the world. “Send them away” said the disciples. Yes, let’s put out of our minds the people we know who are ill, the bereaved, the broken – send them away; put out of our minds the prisoners, the refugees, the starving in East Africa – send them away. “No”, says Jesus, they do not need to go away; you give them something to eat.” “But Lord we have nothing, what can we do?” “Bring what you have to me” says Jesus “And then you will see what amazing things you can do”. Amen.